Staff photo by Emmy Errante. The N.C. Coastal Federation received a grant to retrofit the Blockade Runner Beach Resort's outfall pipes to reduce stormwater runoff into Banks Channel. We at the Coastal Federation are grateful for Lumina News’ consistent and thorough coverage of coastal conservation issues that affect this community. That said, the April 20th story on the collaborative stormwater projects around Wrightsville Beach unfortunately missed the mark on the intent and importance of these projects. The author is correct in the assertion that the projects completed since 2013 did not have an observed effect on the overall water quality readings in Banks Channel and surrounding waters. 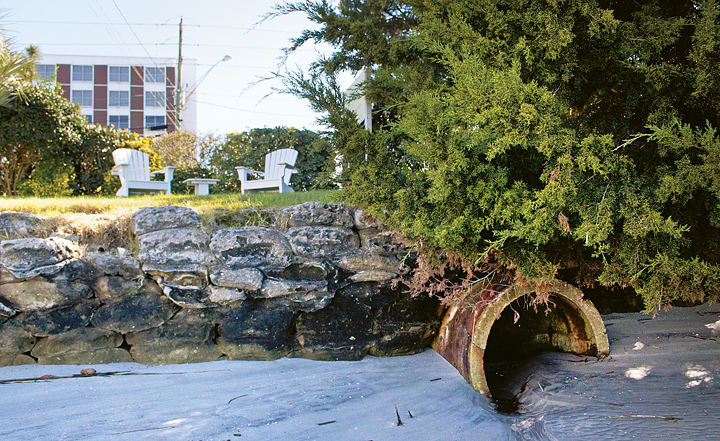 This is because these efforts to intercept stormwater runoff before it exits drainage outfall pipes represent a very small percentage of the traditional drain-to-outfall pipe systems that dominate the drainage system of Wrightsville Beach. Let’s first be honest about the problem. Stormwater pollution is the main cause of water quality impairment along the North Carolina (NC) coast, and climate changes will lead to more extreme and unpredictable rainfall patterns along the coast, thus exacerbating this issue. Although significant progress has been made in the development of watershed management plans, there is fundamental uncertainty about which stormwater management methods are most effective in protecting and restoring water quality from bacterial pollution. Despite current stormwater management efforts, unacceptable pollution levels continue to increase in NC’s estuaries. Consequently, there is a widespread need to identify alternatives to those inadequate strategies for reducing the sources of bacteria and/or treating polluted waters. So, given the magnitude of the problem, what is the importance of these seemingly insignificant projects? Successful projects such as those in Wrightsville Beach scientifically prove that disconnecting the traditional pathways of runoff, and reducing the volume of runoff through infiltration into the modified landscape can be a very cost-effective and successful way to prevent microbial pollution in our waterways. At each of the project sites strategically placed around Wrightsville Beach, the amount of runoff carrying bacteria and sediment that previously dumped directly into our recreational waters has been dramatically reduced or nearly eliminated during normal rain events. These “loadings” of pollution have been re-directed to soak into sandy soils, rain gardens or other infiltration systems, where pollutants can be safely removed and prevented from reaching the receiving creeks. For our residents and visitors who swim, fish, paddle or enjoy the scenery adjacent to these places, this represents a major improvement and departure from previous practices. 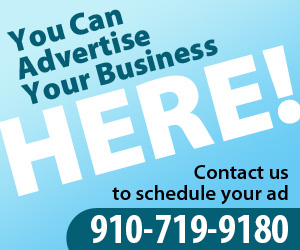 They also represent a giant leap in the right direction by our partners, including the town of Wrightsville Beach and the Blockade Runner Beach Resort. Individual successes aside, the real importance and value of these projects is the potential they hold for future positive impacts. Many of these projects represent relatively low-cost, but highly innovative techniques that are not currently incorporated into traditional drainage system designs for new or existing development. Demonstrating the projects’ success in reducing polluted stormwater runoff is critical to change behaviors and to achieve a wide-scale commitment of towns to invest in these strategies. Once these practices are established, it is far more likely that coastal towns such as Wrightsville Beach and agencies such as NC’s Department of Transportation will incorporate this technology into their public works plans, eventually replacing aging drainage systems with these “low impact development” strategies. The engineering details of these projects must also be shared with municipalities and engineering communities through national trade journals, and professional conferences. Just this week, the Wrightsville Beach projects were recognized by EPA’s national “Rain Catcher” award for excellence in stormwater green infrastructure through community partnerships. This award will be presented during a national stormwater management conference for municipal leaders and other professionals, providing a great opportunity to “share the gospel” with other communities and professionals.